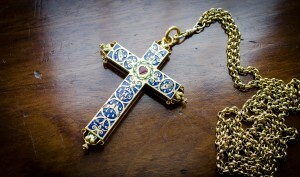 One of the most exquisite Catholic artefacts to survive the depredations of the Reformation is the “Colchester Cross”. One side, against an enamelled blue background, shows the emblems of the five wounds of Christ. In the centre is the Sacred Heart, surrounded by a crown of thorns. Below the Heart are the letters “IHS”, representing the name of Jesus, and above is inscribed “INRI”, the Latin acronym for Jesus of Nazareth, King of the Jews. 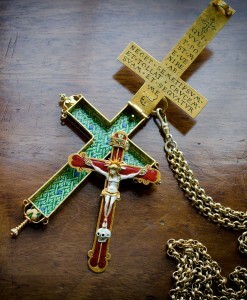 This pectoral cross belonged to Blessed John Beche (alias Thomas Marshall), the last Abbot of the Benedictine Abbey of St John the Baptist, Colchester, Essex, who was hanged, drawn and quartered on 1st December 1539 during the dissolution of monasteries by King Henry VIII. It is today the property of Lord Clifford of Chudleigh but is on permanent loan to Buckfast Abbey, Devon, until such time that there is again a ruling abbot of Colchester. Beche is perhaps one of the lost martyrs of the Diocese of Shrewsbury. He is venerated in the dioceses of Brentwood and Westminster and by the English Benedictines. Yet he joined the Abbey of St Werburgh, Chester, (now the Anglican cathedral) soon after obtaining a doctorate of divinity from Oxford University in 1515 and he ruled as the 26th Abbot of Chester until 1530 when he took up his new office in Essex. 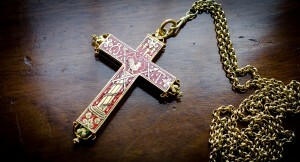 According to Dom Bede Camm, his biographer, he was a “friend and admirer” of both St John Fisher and St Thomas More, although he and 15 other monks in 1534 collectively took the oath attached to the Act of Supremacy, presumably because it contained a caveat demanding obedience only insofar as the law of God allows, which may have bought them time. Beche was, however, always a “strong opponent” of the King’s reforms and became indiscreet about his “grief and bitterness” over the executions of Fisher and More, whom he began to venerate as martyrs for the unity of the Church. In conversations with other “friends”, who would later give evidence against him, he was also critical of some members of the King’s Council, describing them as “tyrants and bloodsuckers” who “hath brought his Grace to such a covetous mind that if all the water in the Thames did flow gold and silver it would not be able to quench his Grace’s thirst”. It is difficult to fault his interpretation of events because in 1538 Sir John Seyncler was sent by Thomas Cromwell to Colchester to demand that Beche surrendered the keys of his abbey to the Crown. Beche replied that the King would have never have the house “but against my will and against my heart for I know by my learning that he cannot take it by right or law; wherefore in my conscience I cannot be content”. Shortly afterwards, he was arrested for treason and sent to the Tower of London. The events between his arrest and execution are fascinating because of what they reveal, even now, about the authentic nature of conscience. Beche had no wish to die a martyr and evidence of his wavering under interrogation in the tower became the subject of controversy when it emerged only after his beatification in 1895 by Pope Leo XIII. His signed renunciation of his opposition to the royal supremacy was recorded with the piteous appeal for his life, “most meekly beseeching the King’s most gracious Majesty and his most honourable Council to be good to me for the love of God”. There is no reason why people in the 16th century would not share our own horror of death and aversion to suffering and it would surely be rash for anyone to judge a man in the “agony of fear”, facing the unspeakable torments of public evisceration, a penalty devised to terrify the populace into conformity by inflicting unimaginable pain on the condemned. But Beche eventually triumphed over his frailty to win the crown of martyrdom. The records of his trial have disappeared but a letter from Sir Christopher Jenny, reporting the proceedings to Cromwell, describes Beche as an “evil man” who stood finally in his “own conceit that the suppression of the abbeys should not withstand the laws of God”, a sign that in the end he publicly rejected Henry’s claim to supremacy over the English Church. He undoubtedly numbers among those people described by Pope Benedict XVI as “faint-hearted” martyrs, who “only after faltering and much questioning succeed in mustering up obedience to conscience, mustering up obedience to truth, which must stand higher than any human tribunal or any type of personal taste”. Indeed, it was not obstinacy which led Beche to a slow, cruel death on the Colchester gallows but the demands of truth. Bishop Mark Davies of Shrewsbury, speaking in Chester on the feast of St Margaret Ward, observed that the heroic examples of the martyrs are beginning to speak ever more loudly in our own times, paradoxically when moral relativism is obscuring objective moral truth, resulting in the consequent loss of a true understanding of the meaning of conscience. This silencing of the voice of conscience has been happening for a long time, of course, and it was Blessed John Henry newman – whom Pope Benedict credits with developing the theology of conscience more deeply than any figure since St Augustine of Hippo – who noted that even in the Victorian age it has become “the very right and freedom of conscience to dispose with conscience”. Newman – following the tradition of St Paul, St Augustine and St Thomas Aquinas – was convinced, however, that conscience was not to be understood subjectively but instead was the “connecting principle between the creature and his Creator”, an echo of the natural moral law inscribed on the heart of every person, a voice that had to be followed scrupulously and with great care. “In proportion as we listen to that Word, and use it, not only do we learn more from it, not only do its dictates become clearer, and its lessons broader, and its principles more consistent, but its very tone is louder and more authoritative and constraining,” he wrote. In a 1991 address entitled Conscience and Truth, Cardinal Joseph Ratzinger explained that it is the martyrs who are great the witnesses of conscience because they attest “ to the fact that man’s capacity for truth is a limit on all power and a guarantee of man’s likeness to God”. Nearly 20 years later, preaching at Hyde Park, London, close to the site of the former Tyburn gallows, Pope Benedict noted that in our own time “the price to be paid for the fidelity to the Gospel is no longer being hanged, drawn and quartered but it often involves being dismissed out of hand, ridiculed or parodied”. In beatifying Newman the next day, the Pope raised to the altars a confessor whose life and work could, he said, “be designated a single great commentary on the question of conscience”. Indeed, the fraught history of our islands has produced an abundance of men and women able to demonstrate with terrifying clarity what we stand for, and why. John Beche is among those from whom we have much to learn, a servant who faltered but who in the end heeded the words of his master to “take up his cross and follow Me”.